If you'e looking for options, Apollo has them. Not only does Apollo produce lightweight, cigarette style products, but they offer several larger, more advanced models when you're ready to take your vaping to the next level. Choose from over 40+ e-liquid flavors, tons of accessories and lots of color choices. 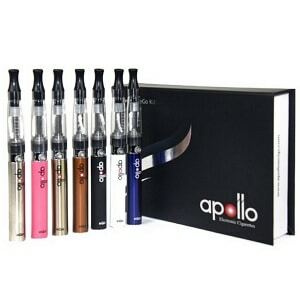 Apollo is an established industry leader with a full range of quality vaping gear. 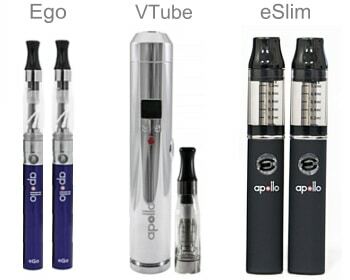 Apollo is another big player in the e-cig industry with long track record of producing high quality vaping gear. Based out of Concord, CA, Apollo owns and operates it’s own research and development facilities in China. Unlike some e-cig companies that just slap their label on low-quality, mass produced Chinese junk, Apollo has full control over the development, manufacturing and quality control of their line-up. In addition, Apollo’s e-liquid is fully developed in Northern California with only the highest-quality U.S. sourced ingredients. 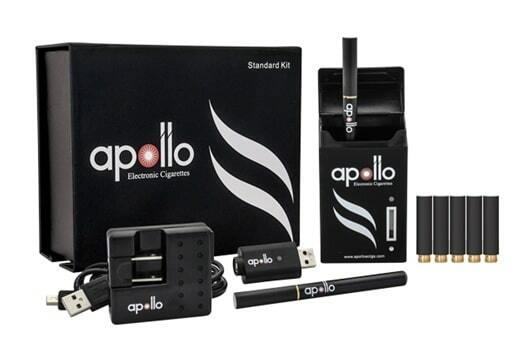 Like most electronic cigarette companies, Apollo offers an excellent line of cigarette-style models, but what really sets Apollo apart is their full selection of advanced products. You won’t find 40+ flavors, clear (and colored) cartomizers, long-lasting eGo-style batteries, variable voltage mods and so many upgrade options at V2, Green Smoke or others. Apollo has you covered, whether you’d like to keep things simple or you’re looking for the most advanced vaping gear. Although there are several different models to choose from at Apollo, when it comes to the slim, lightweight cigarette-style products, you have two main color choices – BLACK or WHITE. The black is sleek and stylish, while the white has a more authentic and inconspicuous look. Both include the standard two-piece design and feature a red or blue LED tip that lights up when you inhale. One of our favorite options with Apollo’s ‘Standard’ cigarette-style model is the ultra cool portable charging case (PCC). Not only is it handy for carrying extra batteries and cartomizers, but it also charges the battery when you don’t have access to a USB or wall plug. Taking 1-2 hours to fully recharge a battery, you’ll get 5-8 charges from the PCC before it needs to be recharged itself. It includes a helpful LED display that lets you know when the battery is charged and when the PCC is running low on juice. A great option when you’re on-the-go and unable access a charger, carry two batteries and up to five cartomizers to make it through your entire day. As mentioned, Apollo has several different designs to choose from so we’ll provide a quick overview of each to avoid an excessively long review. When it comes to performance, the “Standard” Apollo e-cigs perform quite well and produce a decent amount of vapor – about average when compared to similar products from other companies. A few priming puffs may be necessary and you can expect moderate vapor production that will slowly weaken as the battery is depleted. For beginners or light to moderate users, the standard 180mAh battery should do the job, but if you’re looking for stronger vapor production and more battery life you may want to consider the next step up to the “Extreme” model which includes more powerful, longer-lasting 280mAh batteries – but no PCC. In regards to flavor, Apollo has a huge array of choices that are primarily available in liquid form. They offer five different pre-filled cartomizers (Tobacco, Menthol, Coffee, Cherry and Vanilla), but to gain access to their full range of flavors you’ll need to purchase blank cartridges and switch to liquids. The liquids are American-based, 60/40 PG/VG and come in an eclectic array of choices; from classic tobacco, menthol, cherry, vanilla and clove flavors; to specialties such as banana creme, green apple, rocky road, watermelon, grape and more. As you’d expect, there’s also a full range of nicotine levels – Zero (0mg), Low (6mg), Medium (12mg), High (18mg) and Extra High (24mg). Beyond Apollo’s cigarette style designs, you can move up to the Superior Ego Kit, featuring a larger, longer-lasting 900mAh eGo battery – about the size of a cigar. This is the most popular design for serious vapers due to it’s extended life and strong vapor production. Next, is the Apollo VTube Kit, designed for true afficionados that would like to customize the flavor, vapor and throat hit of their e-cig. It includes an LCD screen and the ability to adjust the voltage (3-6V) with the click of a button. And finally, the eSlim Kit is a long-lasting and sleek design that you can fit inside your pocket and uses refillable cartomizers instead of tanks. All of these advanced options can be used with Apollo’s full range of 20+ U.S. made e-liquids. In general, Apollo e-cigs perform quite well and there are a variety of different designs to satisfy every type of vaper. One could easily complain about the reduced battery life or lower performance of the ‘Standard’ Apollo e-cigs, but an upgrade to ‘Extreme’ (or another version) should quickly solve this problem. The standard e-cigs also include the portable charging case that makes keeping your batteries topped off quite easy, so if you prefer the smaller, lighter weight Standard batteries, a regular charging routine involving the PCC could remedy any issues with battery life. Having a little experience with e-cigarettes I went right for the Extreme Kit. Although the standard batteries probably work for some, I definitely need the longer battery life. I’ve had the kit for about 2 weeks and overall I’ve been pleased with it’s performance. Still trying to figure out which flavors I like best. Not a fan of the menthol, but the cherry and vanilla are OK. Switching to liquids shortly. I’ve tried a few different cig-a-like products (ie: Blu, Njoy, etc), but all of them left me feeling unsatisfied and looking for more. I upgraded to Apollo’s Ego kit and it’s far exceeded my expectations! Much stronger vapor and throat hit than any of the products I’ve tried so far. Not sure if I’m ready for (or need) variable voltage batteries like the Vtube, but I highly recommend the Ego to anyone that’s a heavy smoker looking for something stronger and more satisfying than a basic e-cig. I was a PAD+ smoker and tried several cigarette style products before moving to eGo. The minis just never satisfied my needs and I found myself jumping right back to analogs whenever I tried to switch. Luckily, a friend of mine recommended the eGo Kit and I’ve been vaping ever since. The eGo is great because it lasts all day and it’s much more satisfying flavor and vapor-wise than some of the smaller models. If you’re a serious smoker, do yourself a favor and skip the small stuff – jump right to eGo! You’ll quickly get use to it’s larger size and manual operation. Plus, you’re much more likely to actually quit smoking if you use something that satisfies your cravings. Definitely disappointed with Apollo’s standard kit. I knew these were the smallest batteries, but I thought the charging case would make it easier for me to keep them topped off. I only get a few hours before they need to be recharged, and I’m often on the go and don’t have time to fiddle with the case to recharge them. Definitely annoying! I absolutely love my Superior Ego Kit! Thanks to CigBuyer.com for the recommendation… I’m really glad I went right for a bigger ego-sized battery. The smaller devices seem appealing, but I don’t think I would have been satisfied and I probably would have went right back to smoking. So far it’s been 1 month and no complaints so far… great product! Another big fan of the Superior EGO. I’ve used some cheap store bought crap and it didn’t even come close to the quality and performance of this product. Using something that looks and feels like a regular cigarette seems like a great idea at first, until you try something bigger and realize how much more satisfying it can be. Unlike the other stuff I’ve tried, each hit is just as satisfying as a real cigarette puff. I started out with tobacco but quickly moved to sweet and fruity flavors. Watermelon is by far my favorite! I’ve experimented with e-liquid from lots of other companies, but I keep coming back to Apollo’s watermelon. It’s delicious! Overall apollo is a great company. I started off with their standard kit and eventually upgraded to the ego. Great customer support, fast shipping and reasonable prices on most items. They regularly send me coupons and other deals that I take full advantage of, although i buy most of my e-liquid elsewhere. They have some decent options, such as vanilla and ry4, but my tastes have grown and they’re missing some of the more rich, complex flavors that I prefer now. 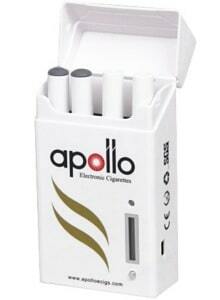 I’ve never tried Apollo e-cig devices, but like Apollo Ygrt ejuice for its peachy aroma. Certainly, I’m not vaping guru myself and still trying to experiment with different eliquid tastes and flavours, looking to find my favourite one.